This stand suits most Ducatis from about 1984 on to about 2002. There is an unused engine mount hole on the bottom rear of the engine crankcases, and the stand has a rod which passes through this hole. It is used like a centre stand. Some models have nothing impeding the use of this stand, while others may need some minor parts moved or removed to enable the pin to fit through. If you want the stand as your everyday bike support for cleaning and maintenance, this stand will only be suitable if your model has nothing impeding the path of the pin. 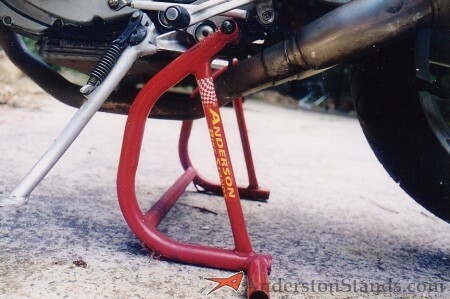 However, if you want the stand as a workshop tool to hold the bike while performing mechanical work such as valve clearance adjustments or rear shock adjustment/removal, then a few minutes spent removing the obstacle before using the stand won't make much difference and the stand will be a valuable tool. If you aren't sure if the stand will fit, crouch down next to the bike and get a line of sight through the crankcase hole. Anything which blocks your vision will have to be removed before you can use the stand. 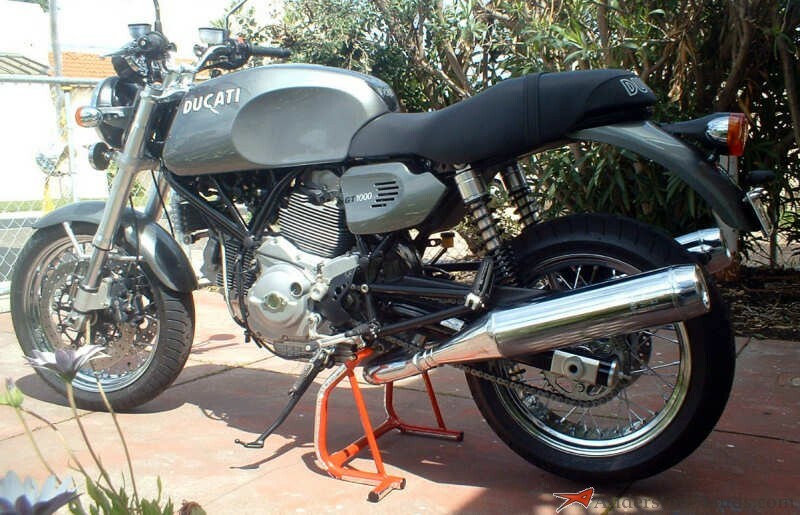 Most Sport Classics can use the Ducati Under engine lifter. We also make special lifting attachments for our Universal rear stands to enable them to be used on the round section swingarm. These work fine on all models except the Paul Smart with the "banana" swingarm - this model makes life hard as there is nowhere for the lifting attachments to sit. We have special lifting attachments for our Universal rear stands to allow them to be used on all bevel models.